Hi, I`m Finley. I`m mostly pale yellow with a blue back which can be seen when I`m flying. I was very lucky to be found as a stray. 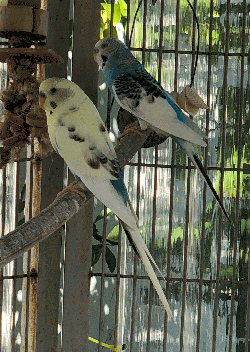 I flew and landed near a Mickaboo volunteer`s aviary! I am not tame, but I am interested and not too afraid if you hold up your hand up with some seed in it. I`d love to find a wonderful forever home where I`ll be kept safe from flying off again!